Just after daybreak, Hamed al-Shaer came down the narrow stairway of his family’s home in southern Gaza pulling a black suitcase and said goodbye to his mother. They hugged at the gate and he kissed her hands in a show of devotion as she struggled to control her emotions. “Emigration is better,” she said of his plan to return to Saudi Arabia where he has lived for the past 13 years, most recently working as a driver. Al-Shaer, whose name was near the top of the list of those cleared for travel, was getting increasingly desperate. If he didn’t get out by early June, his Saudi residency permit would expire. Most Gaza residents can’t travel at all under the strict blockade imposed after the Islamic militant Hamas group seized the territory in 2007. In recent weeks, anti-blockade protests on the Gaza-Israel border — organized by Hamas, but driven by the despair of Gaza’s residents — have drawn new attention to the hardships faced by Gaza’s 2 million people. Hamas’ counterproposals, including a long-term cease-fire with Israel and ceding some power in Gaza to its political rival, Western-backed Palestinian President Mahmoud Abbas, have not gained traction. Yet, Gaza’s population is unlikely to rise up against Hamas because there’s no apparent alternative and because anger over the blockade remains largely directed at Israel and to a lesser extent at Egypt. When al-Shaer first registered on the Gaza Interior Ministry’s waiting list in November, he was told that it would take more than a year to leave Gaza. Rafah has been closed for 110 days this year, while the waiting list has about 25,000 names, though not all may still be planning to travel. He began a frantic lobbying effort, frequently visiting the ministry and even approaching a ministry official at a neighborhood mosque. Al-Shaer argued that he should be allowed to leave sooner so he wouldn’t lose his Saudi residency. On Sunday, al-Shaer was at the departure hall, waiting his turn. He kept checking his phone and pacing up and down as Hamas officials — sitting behind a counter and separated from the crowd by a fence — called out names. Some travelers waved papers, hoping to get the officials’ attention. Al-Shaer’s turn didn’t come that day or the next. Finally on Tuesday, he was able to board a bus bound for the border, but he and his fellow travelers were turned away at the last minute because the crossing was about to close. 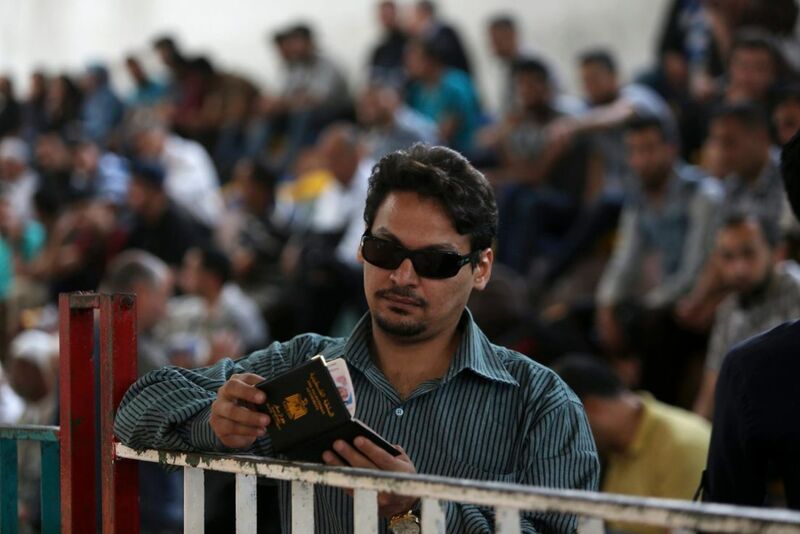 On Wednesday morning, he left his parents’ house in the town of Khan Younis at about 6:40 a.m. Four hours later, he had reached the Palestinian side of the Rafah crossing and got his passport stamped. By noon, the bus arrived at the Egyptian side of the border. Al-Shaer and the other passengers ended up spending the night there, ahead of a trip by bus Thursday through the turbulent Sinai Peninsula, where Egyptian security forces have been battling an insurgency by Islamic militants. Gaza passengers can only travel by bus during daylight hours from Rafah to Egypt’s capital of Cairo and the city’s airport. “You may lose your residency, job and future — sacrifice all of that just to see your family,” he said.